Powers/Abilities: The powers of nature and abilities of its animals. Able to fly like a bird, strong as an elephant, the sight of an eagle, skin as hard as a diamond, etc. Also able to pass her abilities temporarily to someone else. History: Fourteen year old Molly Wilson locked the front door of the library, hanging up the “Closed” sign. It was after hours, but the young librarian’s workday wasn’t over until all the books were filed back onto the shelves. She worked slowly, pushing a cart full of books through the deserted library and humming happily to herself. She was in no hurry to get back to her lonely room at the orphanage. Molly stopped suddenly, staring at a door on the back wall. “Strange,” thought Molly, “That door was never there before!” And it was the sort of door that a person couldn’t help BUT to notice, painted bright red like the doors at the Chinese restaurant down the street. “Gosh, I’d better make sure this new door is locked,” said the little librarian, but when she turned the handle, the door opened. Molly peered in. She saw a long dim hallway, lit by flickering candles. Colorful doors were spaced down either side of the corridor: red, blue, yellow, purple – – all colors of the rainbow. Halfway down the hallway, a green door stood open and a pale light spilled out. As soon as Molly stepped through the doorway into the hall, the door swung shut behind her, but the plucky girl wasn’t frightened. She nade her way toward the open doorway. It was dark inside the room. A solitary light burned on a table in the distance. Molly walked toward the light, hoping to find a telephone but there was nothing on the table except a large leatherbound book and a small wooden box. The book was open, but the pages were blank. The young girl closed the book to see what its title was and gasped “Jeepers!” There, imprinted in the leather of the volume’s front cover was her name – – Molly Wilson! Molly opened the box, and sure enough, there was a necklace and a ring inside, resting on a red satin lining. Both featured a large green emerald. The ring looked too large, yet fit perfectly on her finger. She whispered “Magic?” Then Molly pulled the necklace over her head and touched the stone of the ring to that of the necklace. There was a brilliant flash as lightning erupted from the stones of Molly’s ring and necklace, followed by the deafening roar of thunder. She felt the magical electricity crackle throughout her body, not hurting her at all but rather filling her with power! When the smoke cleared, Molly couldn’t believe her eyes. Her blue frock was gone, replaced by a green frock cinched by a belt with a lightning bolt on the buckle. She felt strong and confident in a way she never had before. “Jeepers – – what’s going on here?” she asked, reaching for the book to find some answers. The old woman actually turned out to be Mother Nature herself, who had chosen Molly to be the champion of all things good in the ancient battle between Good and Evil. Mother Nature bestowed upon Molly the powers and abilities of all animals of the world. Though she sometimes drew upon other powers, Thunder Girl normally made use of the following: the flight of the eagle, the wisdom of the owl, the strength of an elephant, skin as hard as a diamond, and the eyes of a hawk. Thunder Girl soon acquired an arch enemy in the form of Dr Hy Q Binana, a laboratory chimpanzee who gained a human genius intellect in an experiment conducted by Molly’s friend, Prof Eureka. Dr Binana referred to Thunder Girl as “the Big Green Cheesecake”. 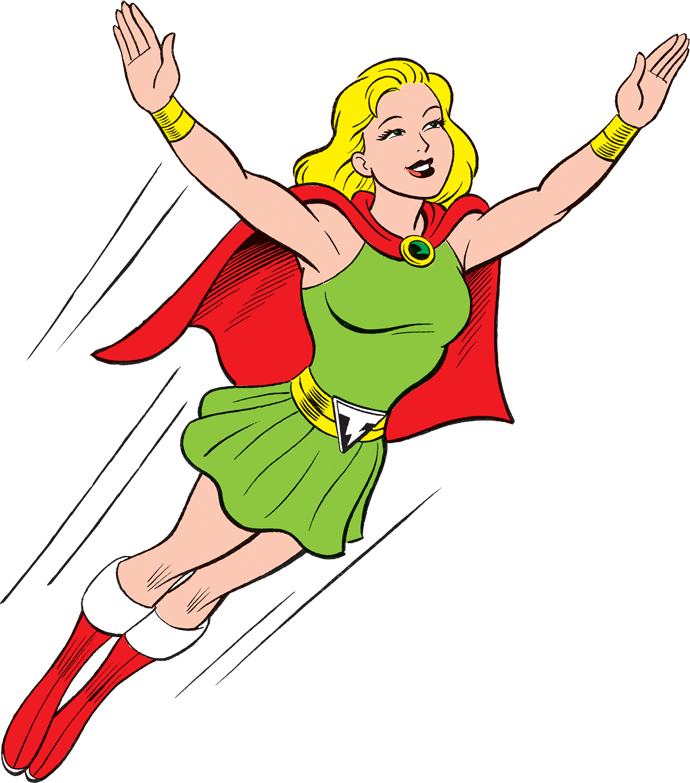 When Dr Binana used science to duplicate Thunder Girl’s powers in a villain he called Tornado Girl, it was revealed that “females are better able to store the cosmic energy” that gives them the powers of nature. In the mid 1940s the evil Dr Binana opened a dimensional portal to Earth A, where it was 1964. Attempting to destroy both Earths with a super bomb on Earth A, he was thwarted when Thunder Girl leapt through the portal from her native Earth B to stop him triggering the device. Both Earths were saved and the portal was closed, trapping Thunder Girl and Dr. Binana on Earth A. Making the best of it, Thunder Girl changed back to Molly, but the differences of the forces of nature between the two Earths was so great, that Molly got amnesia. Found by Ultiman (who was unaware of her dual identity) she was identified by her fingerprints as a missing person and returned to her parents. On Earth A, Molly Wilson who had been a grown woman, an archaeologist who had disappeared while looking for the lost Fountain of Youth. Not only was this Molly not an orphan (having elderly parents), but she also had a younger sister named Eve. Everyone assumed that the younger, amnesiac Molly must have been the result of an encounter with the fountain of youth. A freak electrical storm seemed to be terrorizing Molly, and Ultiman was astonished when a bolt of lightning got past him and struck her, transforming Molly into Thunder Girl and returning her memory. Unable to return to Earth B or to change back into Molly, Thunder Girl “disguised” herself by braiding her hair, adopting a phony pair of glasses and wearing ordinary clothes over her costume. She went to high school, which caused problems since she had no knowledge of anything that happened after WW II and had to learn to like the Beatles instead of Benny Goodman. A further complication was that while Eve was a fan of Thunder Girl, she quite rightly suspected “Molly” of not being her real sister. Thunder Girl joined the Whiz Kids as a way to acclimate herself to the 1960s, and soon found a safe way to transform back to Molly. By 1980 she had joined the Round Table of America along with most of the original Whiz Kids. Molly was now middle aged, (Big Bang characters age in real time), but Thunder Girl was barely out of her teens, aging only during the time she actually spends on earth. The older Molly gets, the harder it is for her to adjust to the age difference between her identities.